The Jura GIGA X9 is the jewel in the Jura crown. 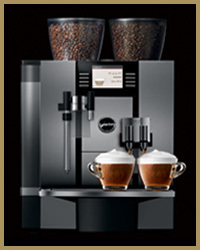 It uses fresh milk to produce its cappuccinos and lattes, and up to 20 different coffees may be easily programmed. Each drink may be individually tailored to customer taste. The 2 bean hoppers allow customers to use 2 types of coffee bean which in turn may be blended into each type of coffee in any proportion desired. A separate steam lance permits customers to froth milk or chocolate by hand should that be a requirement. The machine is fully automatic (one touch of a button to obtain a coffee) and is suitable for sites wishing to dispense up to approximately 200 coffees a day. It may be plumbed into the mains water supply and fitted with a commercial water filter or run as a manually filled system with an in-tank Claris filter. Also available are 2 modular milk fridge units that can hold either 3 or 5 litres of fresh milk depending on usage requirements. There is a separate heating system for each of the milk, coffee and hot water systems. The upshot of these 3 thermo-blocks is that drinks may be made one after the other with little or no down time. Typically an automatic bean 2 cup coffee machine with a foot print this small will allow customers to make 2 black coffees/espressos simultaneously. 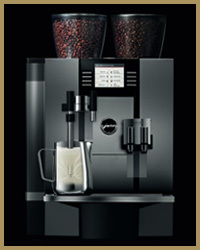 However the Jura GIGA X9 will also permit customers to make milk based specialist coffees such as macchiato, cappuccino or latte 2 at a time.This is another example of how the 3 thermo-block system can reduce the waiting time between serving drinks which is again useful for higher volume locations. The Jura GIGA X9 is very easy to maintain with simple cleaning, rinsing and descale cycles that may be activated at the touch of a button. The machine will automatically run the cycle with very little need for human assistance. This allows customers to quickly, easily and efficiently conduct the daily cleaning routine which is necessary for all bean 2 cup coffee systems, particularly those which use fresh milk. The ease of these cleaning processes means that no specialist knowledge is required to look after this machine on a day to day basis, making it suitable for a great many applications. There are many other useful features including an energy saving mode that cuts in during periods when the machine is idle, a steam wand for the preparation of hot chocolate, and a modular payment unit that may be connected allowing the customer to effectively control costs. We can provide these machines and all of the service support for them that you may require across London, Buckinghamshire, Hertfordshire and Berkshire. Our base just outside of Hemel Hempstead means that we can provide excellent cover for the GIGA X9 in towns and Cities such as St Albans, Hatfield, Slough, High Wycombe and Hemel Hempstead.